If you've been in a front end collision, your AC could be broken. Fortunately, LMR has the direct replacement condenser you need! The A/C condenser in your Mustang sits behind the front bumper in front of the radiator so that the coolest possible air can pass through it, cooling the freon in your air conditioning system. Unfortunately, this puts it in a very vulnerable position. 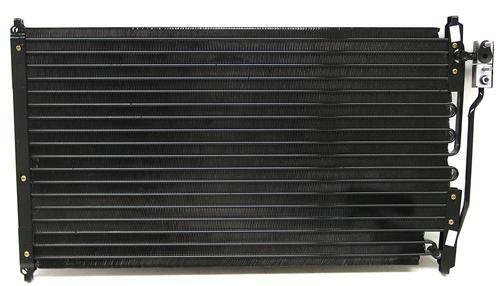 If you were in a front end collision while driving your Mustang, more than likely you will need to replace your A/C condenser. How Does an A/C Condenser Work? First you take freon gas and place it in a sealed system. The freon is then pressurized using a compressor. As it's pressurized, it gets hot by absorbing the heat around it. This hot gas is then circulated through the A/C condenser, which is simply a series of tubes that dissipate the heat by allowing cool air to flow around them. The freon gas can lose lots of heat (get cold) when you reduce the pressure, then as it cools it becomes a liquid.